Reverse site visits – where graduate students travel to local California State University (CSU) campuses to share their experiences in science – are a mainstay of GSDS’s outreach efforts. By answering questions and spending time with CSU students, the GSDS members who participate in these visits help introduce more students to graduate school and the career options that a graduate degree provides. 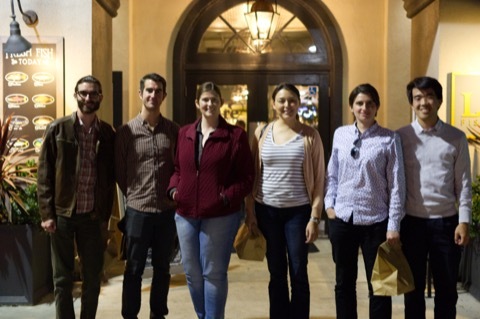 This March, five UCSB graduate students traveled to CSU Channel Islands for a visit. They organized a panel to share why they chose to attend graduate school, and how they’ve navigated their programs. In addition, they answered students’ questions about the PhD degree, GRE requirements, and the typical length of graduate programs. CSU-CI students from a smattering of different departments, including math, chemistry, and biology, attended the graduate school panel. Many students were considering summer research opportunities, but others were still in the process of nailing down their future plans. Especially for students without a clear idea of their next steps beyond graduation, these reverse site visits present graduate research as a viable option. In addition to the more formal panel discussion, a coffee break gave CSU students a chance to get to know their UCSB visitors a bit better. Michael Swift, the physics graduate student who organized this visit, hoped above all else to be “someone [the CSU students] could relate to,” so students could envision themselves as researchers in their future careers. Reverse site visits also allow graduate students to get acquainted with a primarily undergraduate institution. Armed with firsthand knowledge of students’ experiences at CSU campuses as well as the benefits and challenges of undergraduate-focused institutions, visitors return to UCSB more prepared to position themselves for a teaching-focused career. Perhaps the greatest advantage of reverse site visits is the ability to reach a broad group of students at their own home campus. To complement these visits with more in-depth information, GSDS also invites students from CSU campuses to UCSB for lab tours and speaker events. By combining these two approaches, GSDS hopes to help ensure that the next generation of scientists comes from a wide variety of backgrounds.